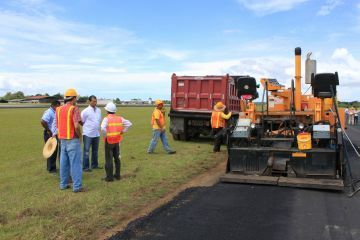 Executives of the Civil Aviation Authority and the construction company Riva Argentina, SA conducted an inspection of the progress of the work of extending the Enrique Malek International Airport in David, Chiriqui. During the inspection work whose cost is 27 million 438 000 $ 845, we verified the quality of asphalt used to repair the taxiway to be used for landing when the aircraft is in full expansion of the runway. The Street Production was extended as required by the SO and the quality of work was supervised by engineers from the FAA and the construction company Riva, SA, and is expected to move jobs properly and are culminating in 18 months with the required quality. The AAC maintain a constant inspection of all airport investment works to ensure that they are of excellent quality and are built in the time established by the tender. In the coming days will be held the previous meeting and approval for what will be the project Construction Enrique Jiménez International Airport in the province of Colon, whose value is expected to be in the order of $ 60 million. The tender for this project will be for best value.